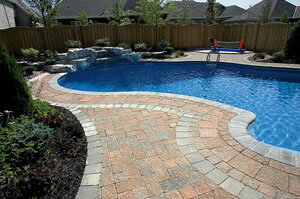 Design West Landscaping has been designing and building stunning swimming pool decks for many years. We provide A-1 services to our residential and commercial clients throughout Northern San Joaquin Valley and East Bay area. No pool deck project is too small or too large for us and we will work within your budget! Pool decking is an important feature for your outdoor space and for your pool area. It provides a safe area surrounding the swimming pool for people to run around or to simply sit and relax. Your pool area really is never complete without the addition of a deck. It is important to get the advice of a professional company so that yours is a safe and durable deck that will serve you well for many years to come. At Design West Landscaping we have a team of pool deck designers who will take your existing pool area and turn it into the pool decking that you have always dreamed of. We use the latest landscape design software that allows you to visualize the installation before any construction begins. That way all changes can be made before hand to ensure you are completely satisfied with the design. The type of material that you choose plays a large role in the overall design. We provide professional installation of Belgard and Pavestone paving stones as well as decorative and stamped concrete. Your design will be unique to your property and increase the visual appeal of your pool area. Decorative concrete is a broader term for concreting techniques such as stamped, poured, stenciled and colored concrete. 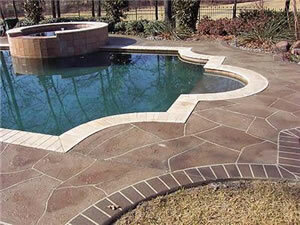 No matter what type of concrete pool decking you have in mind, we are the right company for you. With extensive years of installation experience we can assure you of a beautiful and durable deck. Stamped concrete is a very popular option for it allows you to have the colored deck design of your choice. It is stamped with a pattern to imitate the look of natural stone pavers. You can put the classic look of paving stones stamped into your concrete surface. If this sounds like something that you want then contact the friendly and knowledgeable team at Design West Landscaping today and we will get you on your way to having a beautiful pool deck!